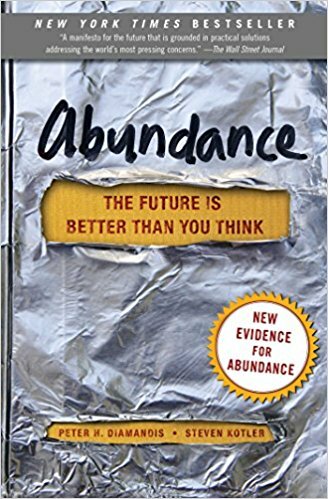 What others thought about "Abundance"
The New York Times bestselling “manifesto for the future that is grounded in practical solutions addressing the world’s most pressing concerns: overpopulation, food, water, energy, education, health care and freedom” (The Wall Street Journal). Since the dawn of humanity, a privileged few have lived in stark contrast to the hardscrabble majority. Conventional wisdom says this gap cannot be closed. But it is closing—fast. In Abundance, space entrepreneur turned innovation pioneer Peter H. Diamandis and award-winning science writer Steven Kotler document how progress in artificial intelligence, robotics, digital manufacturing synthetic biology, and other exponentially growing technologies will enable us to make greater gains in the next two decades than we have in the previous 200 years. We will soon have the ability to meet and exceed the basic needs of every person on the planet. Abundance for all is within our grasp. Breaking down human needs by category—water, food, energy, healthcare, education, freedom—Diamandis and Kotler introduce us to innovators and industry captains making tremendous strides in each area. “Not only is Abundance a riveting page-turner…but it’s a book that gives us a future worth fighting for. And even more than that, it shows us our place in that fight” (The Christian Science Monitor). © 2019	This is Broken.